Whew! Last month on Champagne Nutrition, we chatted ketogenic diet all.month.long. Now onto the next hot topic that continues to rage on: coconut oil. Is it a topic best covered in February because February is also American Heart month. You’ll see a lot of talk about heart healthy foods, supplements and activities. – and a lot of talk about coconut “Heart Health” is a big subject. The actual heart muscle and all it’s valves and chambers, blood pressure and what that does to the kidneys and blood vessels, blood flow to the brain, the feet and essential organs, cholesterol – good and bad, triglycerides, homocyseine, exercise – type and intensity, smoking, alcohol, butter and coconut – saturated fat…the list of topics goes on and on. So: Is Coconut Healthy or Not? The American Heart Association recommends saturated fat in the diet is limited to 5-6% of total calories. On a 2000 calorie diet, that’s 11-13 grams per day. In one tablespoon of coconut oil, there’s 12 grams of saturated fat so yeah…it adds up. I never recommend my clients drink it in smoothies or add it to every recipe throughout the day. I think that the American Heart Association’s recommendations to include saturated fat but limit it to 5-6% makes sense and there are many other types of fats to include that aren’t saturated that should be in the diet as well: olives, olive oil, nuts, seeds, avocado, avocado oil – fun foods! It really depends on your personal health history, family history, labs and goals so, like so many nutrition recs, it’s hard to tell you for sure yes or no if you should or should not eat coconut without meeting with you 1:1 to discuss. Whenever I talk to people about being aware of the fat in their diet, I often get push-back about what happened in the 1990’s when we replaced fat with sugar and refined carbohydrates. I don’t think any health care provider would state that went well – it didn’t. Sugar shouldn’t be replacing anything generally. What I see sometimes now is people including more saturated fat in the diet and there are some benefits there – feeling full and satisfied for one. Sometimes as people liberalize fat in the diet and start eating more, they either maintain their current sugar/refined carbohydrate status or even add in more (remember – many saturated fat sources are rich in sugar, too – baked goods or chocolate for example). I’ve never heard anyone say that eating more saturated fat and more sugar combined is a good thing for health. Is Coconut Healthy or Not? Food&Nutrition Magazine MCT Oil: Miracle Supplement? One thing you might notice people exploring in these pieces is this all-or-nothing, black-or-white, healthy-or-not approach. Will coconut oil kill you or cure you? What about MCT oil? These are the kind of questions I get and as a registered dietitian nutritionist, I’m afraid it’s more complicated than that. It’s hard to study what people eat. 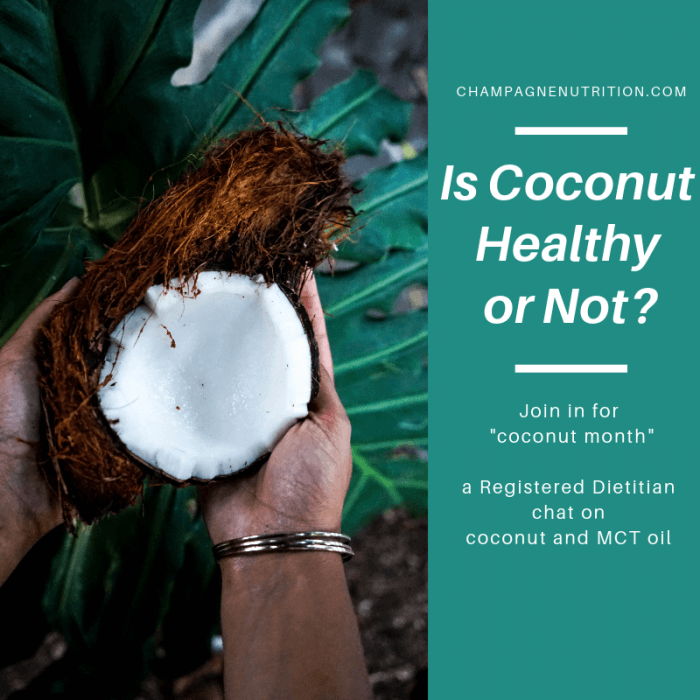 How much coconut oil or MCT are they consuming? What else are they eating all day every day? Do they exercise? Smoke? Drink? Sleep? What’s their metabolism like? What are their genes doing? When you hear “coconut”, think actual coconut meat, coconut oil, coconut flakes, those kinds of foods. Those contain high levels of saturated fat. But they taste great and have many uses in recipes and cooking. MCT stands for ‘medium chain triglyceride’ and it’s more like a supplement. You’ll find it in health food stores or supplement aisles. It’s a clear, odorless liquid that people add to shakes or coffee (it can’t be heated or cooked with). I’ve mostly used that in the clinical hospital setting because it’s useful for some injuries. It’s quite high in calories. It also can give you diarrhea so use caution. Touted to boost energy in the morning to fuel your brain for the day, what you’re supposed to do is to brew coffee (preferably “Bulletproof coffee beans”) and then add 1-2 tablespoons of “Brain Octane Oil” which is in fact MCT oil and 1-2 tablespoons of butter or ghee. Blend this into a latte and enjoy. They recommend enjoying this beverage which has 12-24+ grams of saturated fat as well as caffeine to provide energy in the morning rather than eating the typical carbohydrate-rich breakfast – think oats, toast, cereal, etc. Oil is packed with calories so a Bulletproof coffee can have 400-500 calories. Since it IS a meal replacement, that’s not bad but it just really depends on if this gets you through your morning or not. Each person will be different, as always. I see Bulletproof as a facet of intermittent fasting and also of the desire to put the body in ketosis. See my whole blog on that subject. I love coffee. If you love coffee and especially if you enjoy rich coffee that has butter and oil in it, more power to you. Just know that you’re getting a LOT of saturated fat in this product and depending on your unique needs, that may or may not be a good thing. By eliminating carbs at breakfast, you’re also cutting out a lot of vitamins, minerals antioxidants and fiber so consider what the rest of your day looks like. And I hope it looks like: tofu, beans, lentils, veggies, fruits and whole grains. Just like with the ketogenic diet, I want to tell you here exactly what I think of it, as a nutrition expert. I think coconut oil is delicious! I use it in cooking. I have a jar of it and it lasts me about a year. I use it to grease pans or for stir-fries maybe 2-3 times per month. I use shredded coconut in recipes a couple times per month. It’s a beautiful garnish and adds a nice complexity of texture and flavor. I use coconut oil moderately and I feel great about it because I use a variety of other fats, too. I do not use MCT however – it can cause stomach upset, it’s very rich in calories and I don’t see a reason to use it for my needs. I have suggested it clinically, for very ill people in the hospital for a variety of reasons so my suggestion is generally to use it if it’s medically necessary for you but otherwise, stick to whole food sources of coconut products. I also don’t do Bulletproof coffee – I drink coffee with a slash of soy or oat milk and that works for me. I feel energized in the mornings. If you want some of my favorite coconut recipes, I’ve got them here for you. Enjoy!